Apple iPhone 4 review | What Hi-Fi? They're everywhere; in the final quarter of 2010, Apple shifted more than 16 million iPhones. That's a lot of handsets; they must be doing something right. There's no doubt the iPhone 4 is a hugely desirable item. Build quality all the way up to the volume and ‘hold' buttons is solid and assured. In hand, the phone feels weighty and reassuring, and both front and rear panels are covered in scratch-resistant glass. Scratch below the surface (pardon the pun), and you'll find Apple's own A4 processor powering the almighty iOS operating system. In full flow, it's a system of impressive simplicity and beauty. And iOS is shown in all its glory on Apple's ‘Retina' display. With a resolution of 960x480, this razor-sharp screen packs in more pixels than any of its rivals and makes for a striking menu system. Apple's multi-touch controls are as swift and instantaneous as ever. Tap the relevant programme or App and the iPhone4 is off the mark quicker than Usain Bolt. Of course, the iPhone is boosted by the iTunes store, which is, of course, packed with oodles of Apps, music and movie/TV content. Download to your PC or Mac then sync with your iPhone, or (unlike some rivals) buy direct from the device via wi-fi or 3G – it's that simple. If there was one thing we could change about the iPhone (or any Apple portable for that matter), it would be those annoying bundled in-ear buds. Not only do they sound substandard (Samsung's Galaxy S comes with much better headphones) but also they're a poor fit and pop out at every opportunity. They also help to hide the phone's musical ability, which is virtually unrivalled. Tunes sound expressive, fluid and display a fine sense of timing and rhythm. Vocals display emotion and detail in spades. 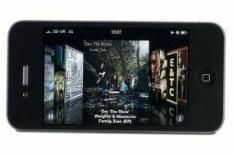 The 3.5 in screen isn't the biggest in the world, but that fabulous ‘Retina' display means that video viewed on the iPhone looks wonderfully sharp. However, blacks could be deeper, whites punchier and motion is handled marginally better on the Galaxy S.
Where multimedia content is concerned, one thing to bear in mind is that more advanced technophiles might not appreciate the limited format support – for example, XviD and DivX users need not apply. We found no issues with call quality (despite ‘antennagate' rumbling on) – the inclusion of dual-mic noise suppression means you don't have to shout at the top of your voice to hold a conversation. The phone's predictive text messaging is fantastic and the 5MP camera is more then adequate. The iPhone is as desirable as ever, but the emergence of a new breed of feature-packed and affordable smartphones means it might not get such an easy ride this time round.